The Basics of Information Security provides fundamental knowledge of information security in both theoretical and practical aspects. 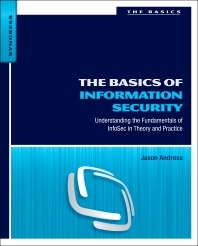 This book is packed with key concepts of information security, such as confidentiality, integrity, and availability, as well as tips and additional resources for further advanced study. It also includes practical applications in the areas of operations, physical, network, operating system, and application security. Complete with exercises at the end of each chapter, this book is well-suited for classroom or instructional use. The book consists of 10 chapters covering such topics as identification and authentication; authorization and access control; auditing and accountability; cryptography; operations security; physical security; network security; operating system security; and application security. Useful implementations for each concept are demonstrated using real world examples. PowerPoint lecture slides are available for use in the classroom. This book is an ideal reference for security consultants, IT managers, students, and those new to the InfoSec field. Chapter 1. What is Information Security? "The complexity of Information Security is oftentimes overwhelming to those individuals new to the field. Unfortunately, there are too few resources available that can provide a clear and comprehensive understanding of InfoSec. This book rectifies this shortage and provides readers a comprehensive discussion on what every security professional should know intimately."